HONOLULU – Nearly 40 Japanese Americans from across the country, including Seattle, are working to strengthen ties between the world’s top economies – Japan and the United States. 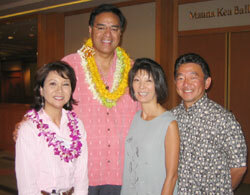 Meeting in Honolulu August 23 to 25, participants in the Japanese American Leadership Delegation Program (JALD) agreed to form an alumni association to advocate and support mutual interests in the areas of politics, business, education and culture. Each year, the JALD program sends a dozen Japanese American leaders for a week in Japan to meet government and community leaders. “There is no question that Japanese Americans can be the catalyst, the bridge to better collaboration between the U.S. and Japan in the areas of world affairs, culture, education and business,” said Sharon Tomiko Santos, a Washington State legislator and 2006 participant. Other past delegates from Seattle include Seattle Municipal Court Judge Ron Mamiya, Seattle Governmental Affairs liaison Kip Tokuda, KING TV Anchor Lori Matsukawa and King County Dept. of Transportation Director Harold Taniguchi. JALD is supported by Japan’s Ministry of Foreign Affairs and the independent Japan Foundation Center for Global Partnership. They believe Japanese Americans who have achieved in their professions and identify strongly with their native place (furusato) can open doors to understanding. The JALD alumni group is a way to form and grow personal relationships that make things happen.